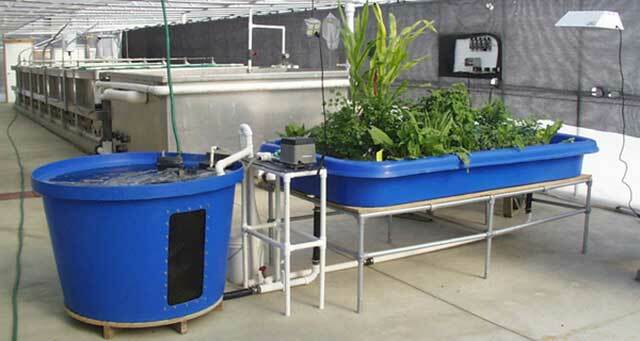 The Aquaponics System is is easy to set up and easy to maintain. It's an ideal way for folks to grow their own fresh fish, herbs and salad greens year 'round. The Aquaponic System is also an outstanding teaching tool for students. The Aquaponic System is made from professional quility components and is designed to produce up to 80 pounds of fish and dozens of heads of lettuce or herbs at a time- all on less than 60 watts! The components will fit through a standard door and when assembled fits into a 5'x14' area. Includes a 200 gallon fish rearing tank and stand, 4'x8' aquaponic bed, a quiet UL listed air pump with stand, all the plumbing to make your system work from the very start, and a complete instruction manual. Requires a stand to support the growing table. The Aquaponic System combines fish culture and true hydroponic plant production into one integrated ecosystem. Easy to set up and maintain, the Aquaponic System can provide you with fresh fish and produce from a clean and healthy environment year-round. It operates so well because the fish are providing the nutrients for the plants, and the plants clean up the water to make it a better place for the fish to live in. This mutually beneficial arrangement is the same as what goes on in nature, but this one is completely within your control. It’s an ideal way to get started in aquaculture and hydroponics! Growing a fish like tilapia (also known as “Saint Peter’s fish,” “cherry snapper,” “silverbacks,” etc.) is easy and you can grow up to 80 lbs. in the Aquaponic System. An optional window in the tank makes learning fun because students can make observations as the fish interact with each other and their environment. The 4’ x 8’ hydroponic growing bed is terrific for a kitchen herb cutting garden, dozens of heads of lettuce or other salad greens. Imagine, fresh herbs and salads from your very own hydroponic garden! In the classroom, there’s ample space for individual student projects that simply makes learning fun and exciting. Our instruction manual shows you how easy it is to grow with us! The Aquaponic System is made with durable, professional quality materials that are fully warranted. It comes complete and ready to set up with a 200 gallon fish tank, 4’ x 8’ hydroponic growing bed, an energy efficient, UL-listed air pump and hydroponic media. Optional equipment is available. The Aquaponic System package’s convenient size fits right through a standard doorway. Fresh veggies and fish year-round — Our’s Aquaponic System is ready now so order yours today!